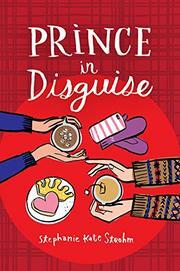 A Mississippi teen finds herself in a Scottish manor for the holidays under unexpected circumstances. Dylan Leigh’s sister, Dusty, found love as a contestant on the reality show Prince in Disguise, and now Dusty is going to marry the prince! Actually, Ronan is really only a lord, as Dylan reminds everyone, but no one seems to care. Now, Dylan, Dusty, and their mother—all white—are on their way from Tupelo, Mississippi, to Ronan’s family home in the Scottish Highlands for the Christmas wedding TV special. Lucky for 16-year-old Dylan, who has spent months dodging the cameras (not so easy to do when you’re 6 feet tall), she gets to be Pippa to Dusty’s Kate, and all events leading up to the big event will be filmed for the pre-special special. Christmas vacation is ruined…until Dylan meets white, blue-eyed Eton boy Jamie, one of the groomsmen. It’s refreshing that they don’t hate-like each other, but rather sparks fly from the start: lightly at first and subsequently heavier as the story unfolds. Then the thought occurs to Dylan: what if the show’s producers are setting her up to be the star of a sequel? Dylan’s best friend, Heaven, is black; the show’s producers bring her over because everyone else is “too white,” a ploy Heaven refers to with a great deal of sarcasm.